You entered this new world of Lisp and now wonder: how can we debug what’s going on ? How is it more interactive than in other platforms ? What does bring the interactive debugger appart from stacktraces ? note: this tutorial is available on the Common Lisp Cookbook and it will receive updates there. If you want step-by-step examples of interactive debugging with nice screenshots and gifs, see the blog posts in the References section below. Well of course we can use the famous technique of “print debugging”. Let’s just recap a few print functions. print works, it prints a READable representation of its argument, which means what is printed can be read back in by the Lisp reader. princ focuses on an aesthetic representation. format t "~a" …), with the aesthetic directive, prints a string (in t, the standard output stream) and returns nil, whereas format nil … doesn’t print anything and returns a string. With many format controls we can print several variables at once. and by CLOS methods and CLOS hierarchy (before and after methods). It is very handy, when we have a lot of output, to turn off the logging of functions or packages we know to work, and thus narrowing our search to the right area. We can even save this configuration and re-use it in another image, be it on another machine. We can do all this through commands, keyboard shortcuts and also through a menu or mouse clicks. We invite you to read log4cl’s readme. Part of the joy of Lisp is the excellent REPL. Its existence usually delays the need to use other debugging tools, if it doesn’t annihilate them for the usual routine. As soon as we define a function, we can try it in the REPL. In Slime, compile a function with C-c C-c (the whole buffer with C-c C-k), switch to the REPL with C-c C-z and try it. Eventually enter the package you are working on with (in-package :your-package). The feedback is immediate. There is no need to recompile everything, nor to restart any process, nor to create a main function and define command line arguments for use in the shell (we can do this later on when needed). When you load this file, *test-data* won’t exist, but you can manually create it with a C-c C-c away. We can define tests functions like this. Some do similarly inside #| … |# comments. These two commands share the same goal, printing a description of an object, inspect being the interactive one. The object is a proper list of length 3. We can also, in editors that support it, right-click on any object in the REPL and inspect them. We are presented a screen where we can dive deep inside the data structure and even change it. 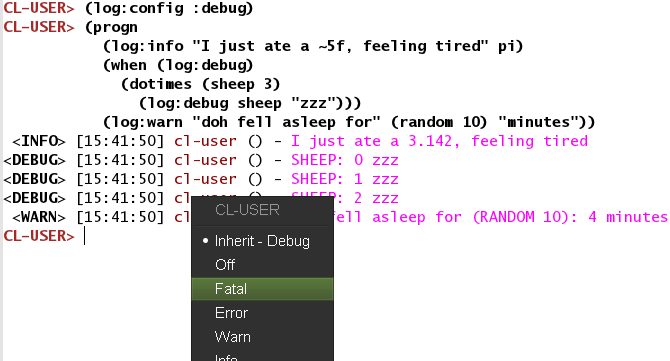 Whenever an exceptional situation happens (see error handling), the interactive debugger pops up. we can explore the functionnality with the menu that should appear in our editor. See below in “break” section for a few more commands (eval in frame, etc). trace allows us to see when a function was called, what arguments it received, and the value it returned. To untrace all functions, just evaluate (untrace). In Slime we also have the shortcut C-c M-t to trace or untrace a function. The output is printed to *trace-output* (see the CLHS). In Slime, we also have an interactive trace dialog with M-x slime-trace-dialog bound to C-c T.
See the CLOS section for a tad more information. 4: [RETRY] Retry SLIME REPL evaluation request. 5: [*ABORT] Return to SLIME's top level. 1: (SB-INT:SIMPLE-EVAL-IN-LEXENV (LET ((SB-IMPL::*STEP-OUT* :MAYBE)) (UNWIND-PROTECT (SB-IMPL::WITH-STEPPING-ENABLED #))) #S(SB-KERNEL:LEXENV :FUNS NIL :VARS NIL :BLOCKS NIL :TAGS NIL :TYPE-RESTRICTIONS .. Stepping is useful, however it may be a sign that you need to simplify your function. A call to break makes the program enter the debugger, from which we can inspect the call stack. e (sldb-eval-in-frame) prompts for an expression and evaluates it in the selected frame. This is how we can explore our intermediate variables. d is similar with the addition of pretty printing the result. Once we are in a frame and detect a suspicious behavior, we can even re-compile a function at runtime and resume the program execution from where it stopped (using the “step-continue” restart). advise and watch are available in some vendor implementations, like LispWorks. They are not available in SBCL. advise allows to modify a function without changing its source, or to do something before or after its execution, like CLOS’ method combination (befor, after around methods). watch allows to specify variables to be displayed in some GUI during the program execution. Last but not least, automatic testing of functions in isolation might be what you’re looking for ! See the testing section and a list of test frameworks and libraries.